Four Seasons Resort and Club Dallas at Las Colinas announces the appointment of Ryan Barnett as the new Restaurant Chef at LAW, the Resort’s signature restaurant. Ryan brings fun and creativity to managing a fast-paced kitchen, and is thrilled to work closely with a talented culinary team. 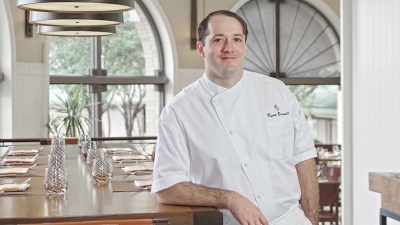 Ryan’s career journey has shaped his passion for food, having worked under some of Dallas’ most notable chefs and in its most admired kitchens – Bistro 31, Neighborhood Services, Stephan Pyles, San Salvaje, Flora Street Café and most recently Lark on the Park before taking his current role at Four Seasons Resort and Club Dallas at Las Colinas. He received his college diploma from the University of Mississippi, where he honed his skills as a line cook at L&M in Oxford, Mississippi. Ryan received his culinary degree from Colorado Mountain College and then ventured on to work in restaurants such as Salumeria in Mississippi, Babbo in New York and Cochon in New Orleans. Ryan’s love for cooking began at an early age while in the kitchen with his grandmother. “Food should capture a memory, a moment in time or an experience that you can carry with you.” His food philosophy revolves around lightening traditional dishes and flavours with the use of pureed fruits and vegetables. Growing up as an Eagle Scout and being an avid outdoorsman, Ryan can now be found fishing, camping, hunting and barbecuing in his free time. This entry was posted in Business, Food & Drinks, Hotels, Resorts, Travel, Travel Management, Travel Services, Travelers and tagged appoints, chef, Chef Christof Syré, Club Dallas, Four Seasons Resort, Las Colinas, LAW, restaurant, Ryan Barnett. Bookmark the permalink.